Diane R. Lee – My clients are my most important assets. Arlington and Alexandria Homes Expert! Real estate is a business in which market knowledge and home analysis is power. The power to price, market and show a home effectively can make or break a house transaction experience. A well-prepared agent is your personal insurance against unwelcome surprises during the purchase or sale of your home. Diane has your best interest in mind. 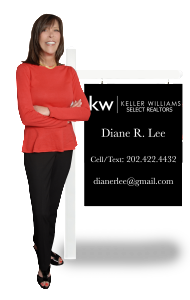 Diane has been my Realtor since 1998, and over the years she’s demonstrated invaluable skills and experience in the DC Metro real estate market. Diane has been my agent of choice for the last 15 years, and has handled multiple transactions for me – home sales, purchases and even rental listings. She is extremely knowledgeable, intuitive to market dynamics, and very responsive! Diane will not disappoint, and she will be by your side every step of the way for what is (for many of us) the largest purchase of our lives. I trust her expertise and her professionalism is beyond reproach. Over the years, I have gained not only a top notch, trusted real estate agent, but a good friend in the process. I highly recommend Diane for any and all of your real estate needs. Get a Free Market Home Analysis Today!